As always, we start with the "Something Else! Intro" before diving headfirst into a few jazz cuts, "Sun Touch" from Herbie Hancock's classic album Manchild and "Night Passage" the title track from a Weather Report album that sees them looking back toward the big band sound as evidenced by their cover of Duke Ellington's "Rockin' In Rhythm" and the title cut as you'll hear. 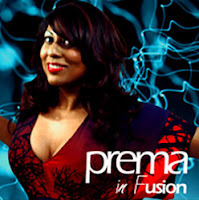 These albums feature some amazing musicians who also show up on the next track "So Right" by Prema, a great vocalist who also writes her own songs and plays acoustic guitar on them as well. A couple of the musical heavyweights who contribute to her album, In Fusion, are guitarist Wah Wah Watson (featured on the Herbie Hancock track) and drummer Peter Erskine (on the Weather Report.) Both have resumes too long to mention here--let's just say they're both real good and I've featured them before on the show in various contexts. I can't say I'm the biggest fan of the next artist, but he does tracks every now and again that I dig. I kind of like the word-play of the title, "Communism" by Common Sense, the MC now known simply as "Common." This track goes back a while for him as indicated by the name change (there was a legal case brought by a California reggae band with the same name) and I've heard bits of it used in other tracks. I just found out that the next track is on Nu Jazz Bistro which just came out a few months ago. "Give It My All" by Sumsuch feat Matty Eeles is from the same Will Sumsuch who I featured in the last two shows. Speaking of new compilations, "Calypso Blues" by Calypso Rose is from Gilles Peterson's Brownswood Bubblers 5. Two tracks in a dub style set us up for a dub-step take on "One Bright Night (Scuba's Broken Window Dub)" by Way Out West. Another person who's been on the scene for a while and hasn't always made music that I've championed is Satoshi Tomiie. An original member of the Def Mix crew (including Frankie Knuckles and David Morales) Satoshi's track "Back To Basics" reminds me of why he was put on early in the game--he's got talent. It's not an amazing track in terms of complexity, but it feels good and isn't that what dance music is supposed to do? "When I Look Into Your Eyes (Quinten 90 mix)" by Fred Falke is another "feel good" house track that leads us into a reworked floorfiller, "Ooh La La (Ursula 1000 Rework)" on new label Muscletracks. This track definitely carries its weight in a set! A classic that's always given me a bit of a chuckle as a navtive of the Golden State is "Take California" by Propellerheads. A driving dance track from the "big beat" era (late 90s) all sorts of fun samples show up, including the one from which the track gets its name--by the late President Richard Nixon, himself a native of Whittier (a working-class area not far from Los Angeles.) Speaking of dancefloor smashes, the next and closing track is remixed by a couple of guys familiar with what I'd call "techno-funk" and written by another guy who is known for having lots of fun behind the turntables and making the crowd enjoy themself as well! "Demons (Stanton Warriors Mix)" by Fatboy Slim will hopefully send you on your funky way and keep you smiling until next week's show!